Click to Get a Bat Removal Quote Now! Bats are the only true flying mammal, and as such they can move freely along wide areas and particularly as winter approaches, into homes and buildings. Bats are prevalent worldwide (except in the Arctic/Antarctic) and they do call the local environment here in Halton and area home. Unlike many animals that thrive in certain seasons or locals, bats only need two things; roosts where they'll hibernate in daytime, and areas for foraging at night. Bats often roost in attics of homes; crevices, hollows found in the man made and natural environment all provide relatively warm places for bats to roost. Bats in your attic can become noisy, bothersome, and damaging! In fact, their presence can be dangerous. Bats can carry diseases that can be caught by humans, such as rabies and ebola virus. Their feces, called guano, can develop toxicity that can endanger home owners. Consider that guano that was left by bats in your home - even if the bats are gone - can develop a toxic mold which results in spores being released into the air. When ingested, it can cause histoplasmosis in humans. This condition can cause serious respiratory disease with initial symptoms of fever and chest pain. Advanced cases can turn into chronic lung disease. Bats are small, nimble and can enter your home in many ways - through small crevices and openings like roof vents, soffit gaps and chimneys. They like to call attics their home. Whether you believe the bats are active or if you believe your home or property housed bats at some point, call us to speak with one of our expert technicians. We will find potential entry points and ensure the bats get out - and stay out. We'll also inspect for traces of harmful guano. As required, our trained technicians will enter contaminated spaces wearing required protective gear and safely clean up bat feces. 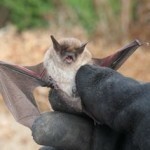 We'll both get rid of your nuisance bat problem and ensure your home is safe and sound for you and your family.